As a species, we’re a moronic, curious bunch. It’s why we put a man on the moon (allegedly), and why we put nanomachines in your grammy’s dicky hip. We just need to know why. The question is often irrelevant, we need answers. 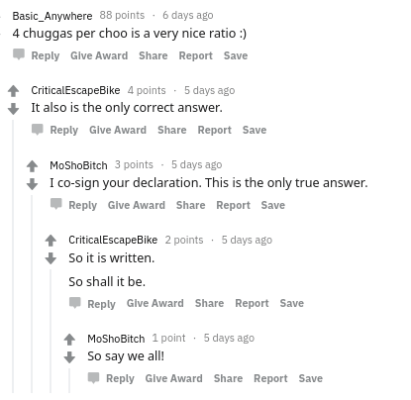 Over on Reddit’s r/TooAfraidToAsk subreddit, dorks of the internet are looking to answer a question that has puzzled us for at least a century.“How many “chuggas” are you supposed to say before “choo choo”? Typically, the entire discussion has gone off the rails, but it provokes you into musing when you pause to think about it. There are certainly different gauges on this verbal locomotive, with some preferring the traditional four chugga count, whereas some preferring the sharp commuter pace of two chuggas, or others the slow commuter pace of eight chuggas. In fact, one user surmised that it should be of equal value placed when one sings the Batman theme. Which, thanks for that, anonymous dork, as that’s all I can now think of. According to Basic_Anywhere and their questionable cabal, shout out to you, MoShoBitch, the only true answer is four. But Reddit elected Donald Trump, so let’s ignore what they think, so what do you think? 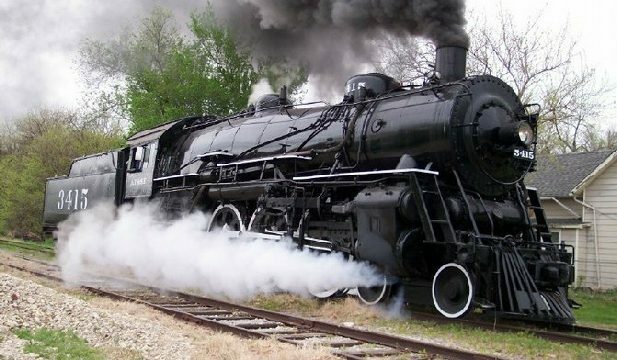 How many 'chuggas' should you say before 'choo choo'?